Located on Saint-Louis beach, surrounded by 2.3 hectares of tropical gardens and recently renovated, this hotel features an outdoor pool and a beauty salon, hammam and massage treatments. 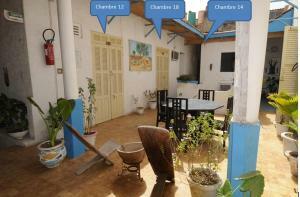 Each air-conditioned room at the Mermoz opens out onto private terraces, some with views. Each room provides free Wi-Fi access and a private bathroom with shower. Guests can enjoy fresh local specialties at the restaurant and experience outdoor dining overlooking the ocean. Food comes from the Saint-Louis Region of Senegal and is combined with classic international dishes. Staff at the Mermoz hotel facilitates tours of Saint-Louis centre and excursions to the nearby Langue de Barbarie National Park. 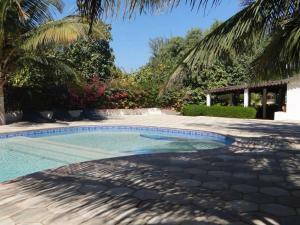 Horse riding facilities are available and free private parking is situated on site. When would you like to stay at Hôtel Mermoz ? This air-conditioned room offers a terrace, Wi-Fi and a satellite TV. It includes a private bathroom. This spacious, air-conditioned room overlooks the ocean and the beach. It has a television and a private bathroom. 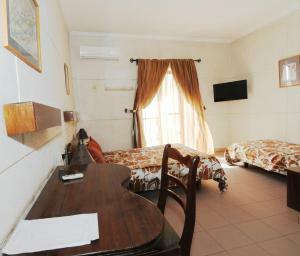 This spacious, air-conditioned room overlooks the garden and is equipped with a TV and a private bathroom. This spacious air-conditioned room includes a terrace, Wi-Fi and a satellite TV. It offers 2 private bathrooms. Please note that the hotel offers transfers to and from the airport. Guests are kindly requested to inform the property in advance if they wish to make use of this service. Contact details can be found on the booking confirmation. Taxis can also be requested at reception. Please note that there is a 4% charge when you pay with a credit card on site. The fee doesn't apply to online internet payments. Each day we'll check prices and send you an email for your selected dates at Hôtel Mermoz. If you don't have specific dates but would like to check prices for say next weekend or say next month we can check the price too. Click to write a review and share your experience of Hôtel Mermoz with other travellers.